through the State Engineering Services Exam CGSES-2017 only. The eligible candidates submit their applications online for this CGPSC State Engineering Services Exam 2017 on or before 01-12-2017. CGPSC State Engineering Services Exam will be conducted in two stages. Written exam and Personal Interview will be conducted to recruit the available vacancies in various departments of Chhattisgarh government. Online applications only allowed for this CGPSC SES Examination. Eligible candidates submit their applications online via the official website of CGPSC@ www.psc.cg.gov.in. For more details regarding this CGPSC State Engineering Services Exam SES 2017 please verify the below given details. Click here to see the official advertisement of CGPSC State Engineering Services Exam 2017 Notification. 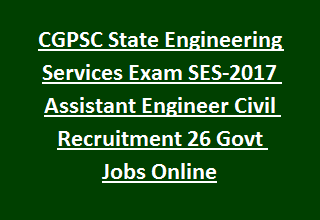 There are total 26 vacancies available in CGPSC current recruitment through State Engineering Services SES Exam 2017. Complete details of available posts and vacancies details are given below. As on 01-01-2017 candidates belong to Chhattisgarh age limits are 21-40 years and for other state candidates age limits are 21-30 years. For SC/ST/OBC/Women Candidates of Chhattisgarh candidate's upper age limit is 45 Years. The candidate must have qualified B.E/B.Tech Engineering in Relevant Stream. For the candidates of General examinations fee is Rs.400/- for SC/ST/OBC candidates examination fees is Rs.300/- and for all category candidates of other states examination fee is Rs.400/-. The eligible candidates has to pay this amount after filling the application form online through the www.psc.cg.gov.in. CGPSC State Engineering Services Exam will be conducted in two stages. Written examination will be conducted for 600 marks of objective type multiple choice questions. Written test consists of two papers. General Studies of India and Chhattisgarh, Mental Ability questions will be asked in paper1. Paper 2 question will be asked from Respected Engineering Topic for 300 marks with 2.30 hours of duration and consists of 150 questions. Each paper consists of 100 questions and each question carries one mark. Eligible candidates have to submit the application forms through online only using the official website of CGPSC @www.psc.cg.gov.in. Click here to apply online for the CGPSC Public Service Commission State Engineering Services Exam 2017 Recruitment.